“Pricing is the most single difficult thing any business ever does.” – Jeff Haynie Tweet This! Alexis: Well thank you, Jeff, for joining us on the podcast. Alexis: Before we get into Appcelerator, tell us a little bit about your background. Jeff: I’m a classic geek. I’ve been programming since the age of 12. Basically, I’m an entrepreneur, geek and I have a wide variety of programming skills and things that I’ve done in the past. I’ve been working in open source since the mid-‘90s in quite a number of projects. Some prominent, like JBoss or Titanium. I had been involved in different business as it relates to open source – both using open source in business but also sort of being a contributor and doing open source for fun and for play. Alexis: Okay. So folks who aren’t familiar with Appcelerator, Titanium – and I doubt there are many of those – give us a rundown of what it is. Alexis: Alright. So how did Appcelerator get its start? Jeff: We started – I’m a serial entrepreneur. I had sold my last company, which is a telecom software company, in 2006. My other co-founder – who was an early employee at that company, an engineer – and I started doing work for a few companies that we had gotten to know pretty well over the years and we had sort of helped them do a number of projects and we started building some different open source projects as part of that effort. The way Titanium got started was one of the projects we were working with was a big company, and they had gotten access in 2007 to what was going to become the iOS SDK eventually. Alexis: So you got a sneak peak. Jeff: Yeah, we got a chance to build a native iPhone app for what became the store in the spring of 2008, and we found it to be quite rudimentary and difficult. We have a long C/C++ assembly background, so we felt pretty comfortable with the toolkit, but we knew that web developers would be sort of lost. So we started what we thought was going to be an easy project that turned into a really complicated project in this Objective-C language, and from that, we started getting this idea about Titanium. Alexis: When you started in – let’s see – 2009, right about then? Jeff: Yeah, the first version of Titanium came out in 2009. We started working on it 2008, or late 2007, early 2008, and decided to build a prototype and have some good first release of what we started showing some investors and some friends of ours. At that time, nobody really believed that Apple was going to be a real contender in the carrier world or the phone world. Coming from a telecom background, we sort of knew what the disruption probably could be, that they sort of put their energy behind it, which they seem like they were going to do. We went out, raised a Series A round from investors here in Silicon Valley and on this prototype that we had and this concept, and so the rest was history at that point. It allowed us to focus 100% of our energy on just building Titanium and starting to build a community around it, and that’s when we focused from the middle of 2008 to early part of 2009 when we released Titanium. Alexis: So you mentioned that you came out here to Silicon Valley. I understand that you were based in Atlanta? Jeff: Yeah. We started the company, grew up in Atlanta – started the company at Atlanta – and the first version of Titanium was really more of a rich Internet desktop kind of framework. When we first started doing it, it wasn’t even mobile; we really tried to do kind of Air, if you will, at the time. Alexis: Ah, so it was a mini-pivot, in a way? Jeff: That’s right, it was a pivot. We always wanted to do mobile, we always intended to do mobile, but we thought of a unified application environment both for desktop and mobile would be really the way we would sort of go. But we felt like mobile applications were still a long way away and Apple was just starting to come out with their SDK, and so we thought that could be a long way away. We started with a desktop framework with Titanium, and we moved to the Valley just because we felt like funding had been a big issue over the years, living in Atlanta, and I felt like it would be a better opportunity to be in the Valley and be around lots of smart people and lots of money. Alexis: Right. Now there are a lot of different cities trying to attract their own startup ecosystem and there is some attitude that you can build a business from wherever you are as long as you have a laptop. Do you think that’s changed significantly since you made the move back in 2009 or so? Jeff: Yeah. I think it depends on what you want to do, and certainly, I think you can build a business – that’s what’s great about open source, that’s what’s great about the cloud, and certainly that’s what’s great about mobile these days. I mean, you can pretty much be anywhere in the world and have a great idea and you can sort of put it up on the Web or build a mobile application and build it into a business. I think it depends on what you’re trying to build; I mean, we felt like this was a great opportunity to do something that was quite large and significant, and we needed lots of capital, we felt to do what we had really hopefully needed to do. We felt that being close to that capital and close to the people that had been around that sort of environment was more important than where we were at the time. Alexis: Right. So you’ve got Titanium going, Apple’s put out its App Store. What are you doing to bring in revenue as this is an open source project? Jeff: Well, you know, that’s the advantage of raising a venture capital early and having patient investors is good or bad – it has positives and negatives to it. For a number of years, we didn’t generate any revenue in Titanium and we had no intention to; it was purely an open source project. A couple of years in, we started experimenting with kind of a commercial version of Titanium and we did that for a while and generated good revenue from that. Over the years, and kind of what our business model is today, we found that really – we felt that the best way to monetize Titanium was to not monetize Titanium but to monetize the things that go around the change that’s happening by building a cloud. And that’s the enterprise stack being disrupted, kind of the middleware stack and the app stack, and things that you did and the more traditional ways of building applications from the desktop in the web that changes the mobility in cloud. We sort of figured that if we can monetize those pieces and not necessarily Titanium itself and use Titanium really as a great way for people to build applications and get into a relationship with us and build a big ecosystem, that some of them – not all of them – would then have some of these other big pains that they’re willing to pay money for those things. Alexis: Right. So give us a little bit of a low-down to your other products that pair with Titanium. Jeff: We have sort of two other big features, if you will, or standalone products, but if you think about it they’re sort of three big buckets for us. We have applications, and Titanium is a core part of how you build and test and deploy applications and all the management around that. Titanium is kind of the core engine for that, and then we built tools and workflow and life cycle capabilities around that for companies that potentially are bigger than a one or two-person shop, and they have more complexities around the application development life cycle. The second big area is within how you connect to data. If you’re a small developer and you’re just using a RESTful API to Twitter, maybe you don’t have really complicated needs; but if you’re a big enterprise, you probably have an SAP, Salesforce, you have a whole bunch of different things that’s really complicated and lots of different apartments and lots of different data access rules and things like that, and so security requirements are different, etc. And so we’ve really built a whole stack – it’s all a Node.js-based stack for enterprise integration and sort of making it easier to mobilize data, and that’s part of our cloud product, the API product. Then the third big area is really analytics; once you build applications to scale and have lots of applications, and these applications potentially drive millions of consumers or they potentially drive tens of thousands of employees in what they do every day, things like performance monitoring and sort of marketing analytics – things like that become really important to the business and how they think about their portfolio of applications. That’s the third big area, analytics, and that’s all part of the enterprise platform. Alexis: Now, you used to use Amazon for all your cloud stuff and you somewhat recently moved away from them, correct? Jeff: Well, we’re still using Amazon for most of our infrastructure. We just recently, in our summer release, announced our private cloud offering, which allows a customer to run our enterprise stack in their own cloud, a third party cloud, like Rackspace for example, or to run it in their own premise, inside their own data center, for example, on premise. But we’re still today mostly Amazon for our public cloud and that will probably be the same for a while. We are looking at some different opportunities. In an enterprise environment, there are a lot of customers for whom Amazon is perfectly acceptable, while for other customers, other sectors, Amazon doesn’t work for a variety of non-technical reasons. So we’re always looking at different ways that we can bring value to our customers, and that’s a good example of where customers – if you think about monetization and how open source and non-open source, if you will – collaborate; that’s a good example of where customers are willing to pay for things like that where if it’s just an open source project, they can do whatever they want with it. But then how do they think about deployment? How do they think about high availability or SLAs? They’ll pay for that, because that’s really, really important for their business. Alexis: Did you ever fathom you could build such a large business on open source? Jeff: It’s funny – I wrestle, we all wrestle, with, “Are we really an open source business, or are we just a business that uses open source?” I tend to think we’re probably the latter than the former. I think it started off thinking we were an open source business, something like Red Hat, which is maybe a more traditional open source business, if you will. I think we’re probably more – over time, I think we’ve really thought of open source as so mainstream. Even Microsoft now is doing open source, right? Maybe there is really no distinction. Google’s an open source business, right? Jeff: Is it an open source company – Google – or is Google really a business that uses open source or that leverages open source? I think it’s probably more of the latter; I think most companies – maybe you can posit all companies one day will be open source companies, or companies that use open source is maybe a better way of saying it. Alexis: Right. Okay, so the lines have blurred even though at the beginning they may have seemed pretty clear-cut. Jeff: Yeah, I think that’s a good thing for the industry. That just means that it’s sort of mainstream and you could argue the same thing – is GitHub an open source company? Well, they produce a lot of open source; they’ve certainly enabled a significant amount of open source growth in the ecosystem, but are they really an open source business? No, I don’t think so. They actually make money by selling something that, at the core, a lot of it is open source. But what they really do is they create a lot of value around a product that was open source and even makes companies and open source projects more effective by using it and paying money for it. Alexis: Now, with having investors, do you have to take any special considerations when you’re working with open source? Jeff: Well, certainly. Usually, all investors – they’ve got a lot more sophisticated over the years. When we first started doing open source, even in my previous company, open source is a really black eye or a big concern about – you had to do all kinds of representation in warranties when you did legal agreements around open source, or if were taking investments, the investor really wanted to understand the open source and what was open source and what wasn’t, because they felt like they didn’t want to put their money into something and then you give it all away in terms of the intellectual property. I think over the years, that has changed dramatically; I think that’s become more of an asset than a liability. In fact, a lot of companies now, the core of their thing is open source or free, and so I think we figured out to some degree how to make investors feel really comfortable about that and, in fact, turn that around to be something that they look for now. And it’s also a competitive advantage; people used to not think of it as a competitive advantage, but now I think, clearly, it’s a competitive advantage. If you’re leveraging open source, you can drive your cost down and you can get better quality products through the sharing economy, then that potentially puts you in a much better position as a company. Alexis: And frankly, if any company is a good example of that over recent years, it’s Appcelerator. Jeff: Yeah, I think so. I mean, we’ve really benefited greatly by it, and it’s a symbiotic relationship. Again, I always like to say that there are sort of two types of open source projects – there are open source projects that really try to create a community and things around it, and then there are just projects which they put the source code online. Is that really an “open source” project? Yes. Technically, it’s an open source project. I’ve open sourced the source code; I’ve made it available, but I really don’t care about contributions and I really don’t care about creating community and really having people actively involved eve if they’re not actually committing code, but they’re actively involved around the project. Alexis: Right. And so once you’ve got people that are aware of Appcelerator and Titanium, building a community gets them to stay there, but I’m particularly interested in the early days. How did you get the word out? Jeff: It’s still the old-fashioned word-of-mouth. In the early days, and even today, I would say it’s still greater than 50%. In the early days, there were a few things: one was online and we just built us an email list and forums and things that traditionally we could interact with people that were using and playing around with the software. I did a ton – I still do – I just did a ton of speaking and going to user groups and just showing it off and demoing it and just doing sort of brute force word-of-mouth. And then just as people started falling in love with it, they just themselves started telling their friends and tweeting about it, and doing all kinds of things like that that really started helping it grow. That’s pretty much how it grows today; I mean, we don’t really spend money on trying to “market” Titanium, if you will. We certainly have now that we’re a lot bigger company and a lot bigger user community, but generally, still, when people find out about it, it’s through a colleague or a friend or another user of Titanium. Alexis: Alright. So over the years, there have been many kinds of solutions that are of the “build once, deploy on multiple platforms” kind of vein – how do you stay on top? Jeff: Yeah, there are a lot of different things out there. Probably two most prominent are us and PhoneGap. We started in the early, early days of both of the projects. We sort of started with similar ideas and pretty quickly diverged – not in principles or anything like that, but more certainly on our approach to how we were going to solve the problem. Along the way, there’s been a ton of other, I would say, riffs off of that that a lot of other people have tried, but I think both of our approaches had been the thing that seem to be sustainable for a long period of time and created large ecosystems around them. I think the way it sustained and the way projects get sustained is that you have to create real value, and I think developers, when they have real value – even if no project’s perfect and no product’s perfect – we created something that really solved a problem for developers and we showed a huge commitment as a company and as a project to really try to improve the lives of developers and the things that they were trying to do, and that just created a big flywheel effect that happened. People use it and they built businesses around it, and they’ve changed their whole careers because of it, and whole companies have been created and transformed because of it, and I think that symbiotic relationship is what creates this huge opportunity for everybody. It’s typical that when you have these platform ecosystems, it’s very, very typical that you have this concept that the whole is greater than the sum of the parts. What you have is – everybody in the community benefits by everybody else. Appcelerator is a company that benefits the more people that use it, the better the community gets. The bigger the community gets, we sort of benefit; the better the community does, customers benefit. The more community people have, more customers come in, and so it sort of gets this flywheel effect that happens across everybody. It’s a sort of a virtuous cycle that starts happening and it feeds on itself, and I think that’s the sign of a – it’s hard to get that. It’s magic! I mean, I’ve been part of a number of these; I was part of JBoss as well as early middleware app servers – a very popular open source project – and it had that sort of phenomenon. It wasn’t like it was the first or the only open source app server out there when Mark Florian and team created that; it just rose above the top and all the other projects died, and it became very big and very famous and went on to get acquired by Red Hat for a lot of money. I think that you sort of see these projects – some fail and some get really big, and sometimes it’s really hard to know why. But I think the “why” is when you create the symbiotic relation between all parties, and that everybody sort of benefits from everybody else’s success. Alexis: As you said, it’s tough to reproduce that, but what do you think is usually the most common fault that leads to that not being able to be reproduced? Alexis: Hello? We lost you for a second there. Jeff: – process is sort of the alignment of people, it’s timing when the project happened and when it didn’t happen – it’s all these things combined that create this special effect that happens. Alexis: Now I feel that we’re beginning to touch on an important point here. Nitobi was sold to Adobe in 2011 for who knows how much, and you guys, it seems, were making a conscious decision not to be acquired? Jeff: You always make a conscious decision to not be acquired. [Chuckling] Who faults anybody for that. I mean, the group – Andre and Brian and those guys – are really, really smart guys; I have a huge amount of respect for them and have gotten to know them over the years. I think they are much different than we were; they want to venture fund the company, they were a small development Adobe partner in Vancouver and they are really, really sharp guys. They built PhoneGap over a weekend event, and admittedly, they used it to do services projects that they were already working on in mobile and it drove business for them. So they had sort of different motivations and different outcomes, I think, than we had. Obviously, we raised money; we set out to try to build a large company, and we wanted to leverage open source in our community as a key asset for that, but we have the advantage that maybe others didn’t have or don’t have, that we could be patient with how we built it and how we invested it. We’ve invested well over a hundred million dollars in our platform and our ecosystem, so it’s just a different long-term and a different set of circumstances, I think. I don’t think one’s right and one’s wrong; I think they’re both dependent on the circumstance of the community and of the people that started it. Alexis: Speaking about what’s right and what’s wrong – whether you’re going to choose to build an app from scratch or do something like Titanium – tell us a little bit about Ti.Next and Hyperloop and what you’re trying to accomplish there. Jeff: With Ti.Next and Hyperloop, Ti.Next being our moniker for the next big version of Titanium, the next big architectural change for titanium. It likely will be called 4.0, but we’re not yet committed to that because we’re not really sure yet when it’ll actually materialize. Hyperloop being sort of another open source project that’s sort of at the core of the Ti.Next concept, and Hyperloop being this big step back in how we think about all the many years now of experience we have of building Titanium on multiple platforms and now that we know all of this that we didn’t know many years ago, what would we do different and how we would refactor that even if we had to rewrite the entire code base. That’s sort of the Ti.Next/Hyperloop effort. Hyperloop, its concept is, could we build a pure compiler, a more traditional compiler pipeline and could we more efficiently generate C and backend code in a different way than we had done with our binding in Titanium and what we call Ti.Current, which is a current architecture of Titanium – and then could you then use that compiler independent of Titanium. So that’s how we created a Hyperloop, standalone open source project, which has no direct relationship with Titanium at all. In fact, the Ti.Next sits on top of Hyperloop, but this concept and the innovations that we really created are – can we take a system MetaBase, which is kind of a database of all the pop opt APIs that any platform exposes. We’ve been working on that for a little over a year, almost a year and a half, and it’s still pretty early. I mean, we’ve been working pretty hard at it; we got a decent-sized team working on it full-time. But the hope is that we’re going to be able to dramatically change what we can target, how you can write native-bound code even for things like node.js, things that are even beyond mobile, or things that are even beyond Titanium, and do an interesting way of converting it into machine code. Alexis: Since Apple is trying to make iOS development a bit smoother and faster to get into Swift, I’m curious – what do you think about it? Alexis: Now you mentioned non-mobile platforms – I guess my question pertains to non-smartphone platforms. You have your finger on the pulse of the device industry and where something Titanium might be helpful. What do you think of wearables and the wearable space for developers as it’s just beginning to get its footing? Jeff: I think it’s a huge opportunity. When we think about mobile and certainly non-handheld, non-tablet oriented devices, we think that long-term is going to be very significant and we think we’re going to play an important role on that future – and hope to – and we hope Titanium and Hyperloop will play an important role in that. We think that, from our standpoint, half a trillion devices will be connected to the Internet in the next ten years plus very few of those will be used by humans directly and most of them will be machine-to-machine, Internet of Things-oriented type devices. And I think our sort of ten-year out feeling is that the interesting applications are going to be these multi-point collaborative applications, things where they can leverage all the devices and sensors and inputs and outputs around me, and sort of the APIs have to become really, really super complicated and context-aware and data-aware and device-aware. Applications are running on a variety of devices; some are on our behalf, some directed by our input or output, and I think that’s a multi-device, multi-point kind of world that we’re headed for in the next ten years. We think we have a big opportunity to play in that space and we think that Titanium and Hyperloop will be a key opportunity for everybody that’s going to need to build for that world. Alexis: I was just thinking about an app on my phone that uses something from my smart watch to push it to my laptop is starting to blow my mind. Jeff: Yeah, and you can just imagine when your car is enabled and – I live in Silicon Valley, so I have a Tesla like anybody else and it’s just amazing, sort of the anticipatory computing opportunity. I walk up to my Tesla and it knows, because I’m present, it knows who I am, it knows to unlock the door, turn the car on, turn the lights on if it’s dark. It sort of anticipates my needs as a human, and so you could start to imagine my watch, my phone, my garage, my television, my heating system, my air conditioning – all these things starting to anticipate me as a human and my actions and my preferences, my location, my context. And so I think that’s the future we’re headed towards in the next ten to twenty years, and I think that’s really where we have a huge opportunity as a society to really make life better for everybody. Alexis: You made it clear how important the community is to you and Titanium, have you run into any challenges that you think might have been avoidable, or maybe not easily solvable by other folks? Do you have some pearls of wisdom to share? Alexis: Everybody’s pulling in their own way. Jeff: That’s right. Everybody has their own motivation for why they’re there – some might just want to be there because they do this on their off time; they really just like doing it, but they do something boring at work and this is just their outlet. For other people, this is their full time gig; they do consulting projects, they built a business around this – they live or die by this thing. Other people do it as part of their job; they’ve been assigned to work on Appcelerator-oriented technology at work, and that is more of a professional thing for them, but they could care less outside of work if they use it or not. It’s got sort of a variety of people that have different needs and different opinions about where they’re going and what they need. It’s hard, because it’s hard to balance all those varying, different constituents, because you can’t make everybody happy all the time. As you try to align for the people that pay you money and that need to do this full time, that really care about certain commercial-oriented things, potentially maybe you will alienate somebody who just really wants to play with it or really wants to do this for fun, etc, and vice versa. You sort of get into all these varying constituents, so what we try to do is we try to be as transparent as we can. It’s hard, because you’re building a business; you can’t tell everybody everything and you can’t always telegraph to the competition and to other people what you’re trying to do. So we try to have very pure motives, we try to be as transparent as we can; we try to set up a lot of feedback loops in the community and programs and certain things to drive a very programmatic input back to us. We spend a huge amount of energy and time, personally, in the community talking to people, all the time. And then there’s a bunch of magic that happens that we don’t really know why or how or what, but it just sort of happens. I think the pearls of wisdom are, you have to think of it as – everybody in the community are individuals. Alexis: A kind of balance? Alexis: They keep you on your toes, yeah? Jeff: Keep you on your toes, and you try to do the best you can by that. Alexis: So following that thread that I mentioned earlier – I think I might have completed two questions here. A mistake that you’d rather not repeat – is there one that maybe you’re comfortable sharing that could help other folks out? Jeff: Yeah. We’ve made a lot of mistakes, and the one mistake we made – and I wouldn’t say we’d even figured this one out. I mean, we had some challenges in transparency of pricing and what was going to be – and a lot of this wasn’t so much, it was more of the people in our company at the time that this sort of conflict between sales and people that were trying to make money in, tasked to come in and make money on a product, and how they communicated it with people in our community who are looking to potentially spend money beyond the open source project, and the way they communicated and how transparent they were in sort of some of the things that had happened, and they weren’t perfectly aligned there, right? They didn’t understand how open source worked and they didn’t quite understand our community and our long-term intentions and this represented us and the company into our community. I think that’s hard because you’re trying to build a company and you’re trying to add people that may not appreciate all the things that you’ve done in the community and all things that strategically you’ve tried to help the community with, especially when you’re asking people to go off and generate revenue and have certain products that do things beyond the community. We’ve always tried to be as transparent as we can; in fact, we’ll be announcing some stuff here in a couple of months that are going to really open a bunch of things up. We didn’t make it clear what was free and what was open source, what was paid and what you got and paid that you didn’t get in open source and vice versa, and so we’ve really tried in the last couple of years, tried to be much better about that and be more clear about that both in terms of the content we put on our website, the languages we use, the brands – when you use Titanium versus when you use Appcelerator as product branding and things like that. It’s hard; it’s a really, really difficult thing. Alexis: So you mentioned sales and a lot of open source projects have issues where they’re being monetized. “At first, we priced too low and now we have to adjust.” What have you learned from pricing that may or may not have mirrored that kind of thing. Jeff: Pricing is the most single difficult thing any business ever does, whether it’s an open source business or not. It seems easy, and I would say try to keep it easier. Another mistake – I shouldn’t say it’s a mistake – but one of the things that I’d try to do differently in the future is having something that people pay for even if it’s something completely free and open source, but having something that is monetizable and getting people into a condition that there will be things that you will monetize earlier in the process I think is a good thing, so that’s one. The second thing, I think pricing is really difficult, especially in companies like ours where we’ve given so much generously away for free and we treat it as if it’s a paid-for product, and that’s a hard thing to do because it’s impossible to unwind that later or potentially change that in some other way. Pricing is very, very difficult; there is no easy formula for pricing. A lot of it has to depend on your business model and where you see value. For people that are maybe trying to figure this out, there’s this balance you want between you don’t want to do it too soon, because then you sort of cut off the ability to grow a community if you do it too soon; you don’t want to do it too late so that the community gets conditioned to believe everything will be free forever and they’ll never have to pay for anything and you create sort of this entitlement community. But I would say sooner rather than later is probably – if I was going to err, I’d probably err the other way next time. Alexis: Alright. So you mentioned hiring as well – well, at least not specifically hiring, but having some folks in the organization that maybe didn’t align with the core values and that kind of thing – what do you look for when you’re hiring in terms of values? And maybe, again, drawing in for more open source projects, they typically tend to hire, at least developer-wise, folks who have contributed to the core project itself and rarely do they outsource and find folks that might apply otherwise. Alexis: It’s a two-year interview. Jeff: Yeah, they’re doing it there for you, and in some ways, it’s the best thing in the world because they think, “Gosh, I love doing this on my off time, and now I get to go do it and get paid to do it.” That’s really one of the cool things about a commercial open source project. You still have disadvantages too. Rarely is there enough of those people that you could hire them all at once, and you have to walk this fine balance between – you don’t want to hire everybody. You may hire the best people in your community to work with you and you still want to have great people in your community that are independent, that are a company, and that will keep you honest and aligned and to help the community beyond commercially, and so that’s a hard, fine line to walk. At some point, if you’re creating a company, especially where potentially a lot of the product is in open source – it’s maybe built on top of open source, but a lot of the actual things that you monetize are open source – those potentially can be different developers. Potentially, there’s overlap between the people that are sort of community open source developers from more traditional product developers, maybe they don’t care about the community. It’s not that they don’t care about the community – maybe we should rephrase that – they care about the community, but they’re not used to operating in open source; they’re not comfortable with that. And they’re still great developers; they’re still really amazing developer. And so you have a different culture, and so that’s a hard thing to… I think we’ve done a good job; I mean, part of the reason we’ve done a decent job is that me and my co-founder have been involved in open source for a long time. We’re very involved in the code, we’re very involved in the community, we’re technologists the other day, so people tend to trust us, that we’re not just trying to come up with things and say things just to say them and that we really do care. Yeah. Alexis: So enough about your mistakes. Are there any decisions that you’re particularly proud of in hindsight that may not have seemed – that might have gone against the grain or otherwise? Jeff: There’s a few. In 2010, Apple came out with both us and PhoneGap and a number of other projects like Unity3D and a bunch of the platforms, if you will, or developer tools around the Apple ecosystem. They changed their terms of service where you couldn’t “use” these products and of course, we were probably about three months of being out of cash. Jeff: That’s right. From a commercial standpoint, people wanted their money back and people said, “I just bought this thing and now it looks like Apple’s going to ban it; we can’t use it; we’re still going to have to go back to native,” and it just became a big crapstorm. We’ve been working on it for well over two years by that time – more than that really – and we felt like we’d move our families to the valley and we just felt like, “Oh, my gosh. This is the end of the road.” One of our early investors – actually, one of our first venture investors, Ryan Floyd from Storm Ventures – he’s been involved in a lot of different open source things; he’s involved in a number of open stack-oriented investments right now. He basically told us, me and my cofounder Nolan, he basically said, “You know what? Keep doing what you’re doing and we’ll figure it out. Don’t shut the company down. I don’t really care; just keep doing it, we’ll figure it out.” You’re an entrepreneur – figure it out! If we have to go all in Android and just screw Apple and just abandon the Apple platform because they’re going to ban us, then so be it. There’s too much good happening here for this thing to give up, and so he really motivated us to really double down. There’s a number of things that we did, but what happened was about three months later, we’re almost out of cash, Apple basically kind of – Steve Jobs wrote his famous blog post and they kinda relented and kinda clarified and changed and clarified the terms of service and kind of changed them to where it wasn’t banning us, and we raised 10 million dollars that month in a new round. And the community just absolutely went berserk at that point and grew very, very fast after that. That was something that I think we’re really proud of. I mean, you never want to give up as an entrepreneur, but you also don’t ever want to be hanging onto something that is going to be a dead end as well. And that was a real turning point for us, to think about, “Gosh, we do really have something special here that took a long time to create and we can be resilient here and we can be entrepreneurial and we can have faith. A lot of people stuck to us; some of the most popular and well-known people in our community are people that stuck to us during that time, and it’s been really rewarding for me as an individual. Jeff: We did organize for the next day. I organized a call with the principals of all those projects and we had put together sort of this game plan and how we would at least try to have a unified front, if you will, and try to think through how – even though we were all competitors – we at least wanted to band together and figure out how do we survive. That’s sort of how I got to know a number of people in the competing products, if you will, was to do that event. Alexis: So you’ve acquired quite a few companies – Aptana, Singly, Nodeable – how do you know when it’s time to acquire a company or just build those features yourself? Jeff: That’s a really good question. We’ve sort of developed, I think, a formula that we think works and we feel like we’ve proven out at least. Most times it seemed to work pretty well for us; we have a good success rate with it. A lot of what we’ve done is we’ve tried to figure out what’s our long-term vision, and what are the things that we feel like we’re going to want. Obviously that changes over time. It’s like any road map – there may be a thousand different ways to get to California from New York, but you know you want to get from New York to California. There may be a route you take to get there, and it may take you a little bit longer, and maybe you have to have a detour or whatever, but ultimately, you’ll get to that destination. I think products are like that. You have this long-term vision of where you want to get to and over time, sort of how you get there – some things speed up, some things slow down. We really try to do that; we really look at the macro picture, our long-term vision, what we’re trying to accomplish, and then we sort of look at what are the plays and steps and strategic moves that we can take within the product, but also sort of organically and inorganically. And then it’s just the timing, really, sometimes that drives it. Sometimes, you sort of need to do something and you don’t have the capability or capacity, and so you look external to do that; other times, you get into these fortuitous opportunities where maybe you weren’t thinking you would do that today – you would do it tomorrow –. Alexis: And here it is, pre-built. Jeff: Yeah. Somebody shows up and says, “Hey, I’m interested in doing something and there’s an opportunity,” you go, “Wow, okay, we weren’t expecting to do that.” We were thinking about building it, but there’s a sort of this “opportunity presents itself” and it fits well with kind of what we wanted to do. I think you have to be sort of agile, but you sort of… Private company acquisitions are really difficult; they usually fail. Certainly, they always fail and the big companies – I’m sure you have this classic public-company-buying-private company, what do they do with it kind of thing – but I think it’s even harder when you’re a private company acquiring – a small, private company acquiring a smaller private company. But I think what we’ve always tried to do is we always try to find companies that have really, really technical founders like we are that deeply care about the product – in fact, that’s really what they care of the most about – and often they’re not sure if they can turn it into a long, standalone business, but they like the sort of long-term opportunity of continuing to do what they’re doing. And they’ve got good technology. Of all the acquisitions we’ve done, we’ve done five to date, they all fit that bottle. They’re all relatively small – 15 to 10 or less people. Almost all of them except one was venture funded, so they had good sort of invested technology. They had really, really strong technical people in the company, and their products fit very well with what we wanted to accomplish. In every single case, within six months, we’ve integrated the products, integrated the teams, and become part of our product suite. Alexis: One thing we didn’t really touch on much is the marketplace. Tell me a bit about it. Jeff: Yeah, the marketplace is a really an attempt… We heard a lot, and we still see this. It’s still sub-optimal for us but we still think there’s a lot of value in bringing different people that have different needs together in a more formal way. What we kept seeing and hearing was people trying to find extensions – we call them modules – to Titanium and they were across a variety of different places. We’ve sort of put these together; we’ve sort of kept hearing about that and so it was like, “How do we put together people that want to sell or market or make available their third-party connection into Titanium and Appcelerator with people who want to consume that kind of stuff?” And so that was sort of the outgrowth of the community was the marketplace product was, “Let’s put this together and make it easy.” We didn’t do it for Apple; we didn’t want to make money off of it. We do charge a small fee, but we just reinvest that directly into the marketing and running of the marketplace, and it’s been very successful. Alexis: So what’s the future? Any challenges you face that you think you need to overcome immediately? Jeff: Today, it’s a little too cumbersome. We feel like, in fact, we’re looking at this right now about “do we just re-launch it in a different way, or rethink it?” There’s a lot of friction right now with the product we used to build the marketplace; it’s more like an App Store than we really intended, so it’s got a lot of friction on listing and creating and buying or using. We’re looking at different ways that potentially we need to make that easier. There’s also a really good third-party – one of our people in our community has built a really good third-party marketplace for modules called getIO that’s really, really popular right now. It automatically pulls open source modules from GitHub; it can have a search and find, it’s got a lot of metadata, and so we’re looking at some different ways that potentially we can really expand it, make it easier, remove some of the friction. We’ve got about 20,000 modules that have been built on Titanium, so it’s quite large, especially as you compare it to the npm for Node.js. But unlike npm, like I said, it just got a lot of friction to it, so we’re looking to try to rethink that this year and beginning it next year. Alexis: You may have covered this a little bit but, how do you stay on top of all things changing in the mobile landscape to keep ahead of the competition? Jeff: [Chuckles] Oh, man. That’s one of the benefits of community; you get a lot of input. Alexis: I need this feature! Jeff: Yeah, you get a lot of opinions, and truthfully that’s probably mostly what drives it. Obviously, we have our own ideas about where we’re going, but the greatest thing – I always say, one of the values we get out of, let’s say, Titanium, that maybe we don’t get out of some of our commercial non-open source products is that every nook and cranny of Titanium is crawled over, used, tried, tested. Every piece of source code is scrutinized and examined, etc, and you just get that in a commercial product, right? You just don’t get that level of usage or credit – usage of, or scrutiny of code and things like that – and so a lot of what we do is directly driven by we just have all these people that tell us, and our product teams can synthesize it. You just hear enough people asking for the same thing, or complaining about the same thing, very quickly you know what you need to do. You don’t always have that in a commercial product, and certainly we don’t have that same amount in a commercial product. You might have a big customer that very specifically needs something, but that may be one lone voice across hundreds and hundreds of customers, right? And so you just don’t get that same level of input. It’s not actually bad or good – it’s just different, right? You have to be different about how you think about product features and management of their broad map and things like that and be more proactive in a commercial product to really solicit feedback differently than you do in a community like the open source community. You just have massive numbers of people, and it just bubbles up to the top. 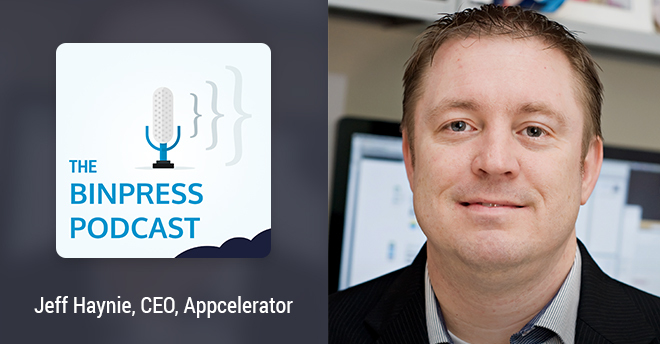 Alexis: So what’s next for Appcelerator? Alexis: And now for a few more fun questions. What is your code/text editor of choice? Alexis: What’s a go-to app or solution for internal communication over at Appcelerator? HipChat? What do you guys use? Jeff: We kind of have two different things internally. Everybody on the engineering side, all the product teams, everybody uses Flowdock, actually, and we have a ton of Flowdock groups. We have several different offices, and outside of here we’ve got Singapore, China, San Francisco and Mountain View – our four main development centers – and then we have a number of developers who are also just sort of remote or working from home. We do have a part of the company like marketing and develop relations with some of those. They all use HipChat. But we try to get most people on Flowdock for the company. Alexis: Alright! Is there anything I missed? Jeff: I don’t think so. If you want to learn more about us, we have a pretty big GitHub repo, GitHub.com/appcelerator and that’s where all our open source projects are. There’s a lot of stuff obviously with Titanium, but we have a ton of other stuff even beyond Titanium. We’re very, very big and contributing back to open source and our code speaks for itself. Alexis: So where can we find you one Twitter? Jeff: I tweet at @jhaynie – J-H-A-Y-N-I-E.
Alexis: Alright. You can find us @Binpress, and you can find myself @alexissantos. But before we go, I have a few surprise questions from Frederico Knabben, creator of CKEditor who was on the show last week. First of all, he says hello. Alexis: And what’s the impact of the mobile web when it comes to content creation nowadays? Jeff: Well, we haven’t seen a ton yet of content creation around the mobile web. I think it’s still very difficult for products like his to operate on mobile devices. Tablets, it gets a little bit easier, but the smaller, foreign factors are really difficult. The browsers have a long way to go to really support those types of capabilities. They’re getting much better, much quicker; certainly Chrome is really pushing the edge and certainly the new Safari, but I think there’s a long way to go for that. Alexis: And the second question is, what would you recommend that quality content creation tools like CKEditor should do to responsibly take part of this transition towards the mobile web? Jeff: Well, I think what they have to do is they have to push the mobile browser vendors. Part of it is the challenge of the browser itself as it relates to a small form factor device and the memory and footprint and CPU requirements, GPU requirements of those devices – you don’t have those concerns in the desktop. I think that’s just what you have to do, is keep pushing for better and better performance on these devices so that the way it performs, if you will, is as fast as native applications. Alexis: Alright! Well, thank you, Jeff. I am all out of questions, which you’re probably thankful for. Jeff: No worries, I enjoyed it! Alexis: Alright! Thanks for being here and for the listeners, we’ll catch you next week.